The Women’s Caucus had a brief press conference Tuesday. 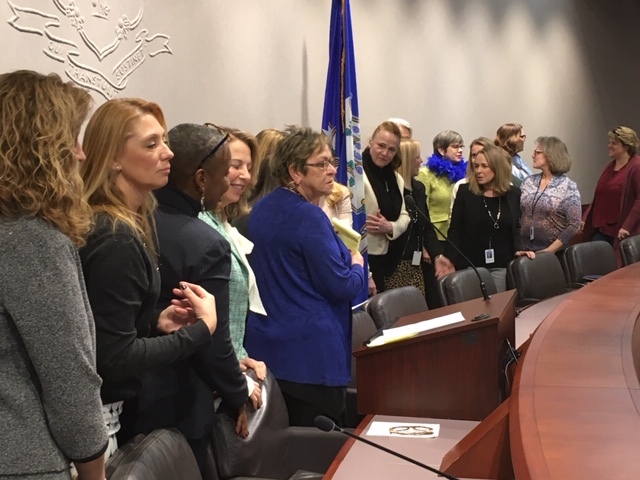 The Connecticut General Assembly’s Women’s Caucus chose its leaders Tuesday, leaving for another day the more difficult question of setting an agenda acceptable to a caucus with 37 Democrats and 24 Republicans. Twenty of the 61 members are in their first terms. The caucus has co-chairs from each party: Rep. Dorinda Borer, D-West Haven, and Rep. Rose Rebimbas, R-Naugatuck. Borer succeeds Rep. Kim Rose, D-Milford, who was re-elected to the House, but declined another term as caucus co-chair. The 61 women in the House and Senate comprise 33 percent of the membership in General Assembly, up from 27 percent last year. Nationally, women didn’t crack 25 percent of all state legislative seat until 2018. The only woman in a top leadership position in the legislature is House Minority Leader Themis Klarides, R-Derby. Forty percent of the House GOP caucus is female, as is the Senate Democratic caucus.